What a great weekend I had. The Surface Design group that got started this spring is in full swing. We got together this past weekend. All five of us on Friday and then some on Saturday and Sunday. 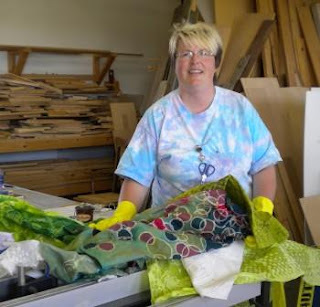 I hosted at my dad's wood shop while Diane did the research and lead us in wax Batik. Judy also helped with the research and had a demo for us. 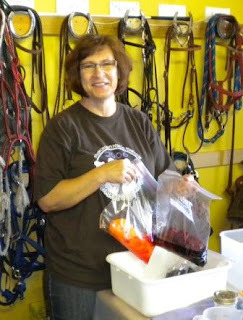 Diane holding up some bags with waxed fabric in the dye. We started on Friday with a talk and then on to wax. 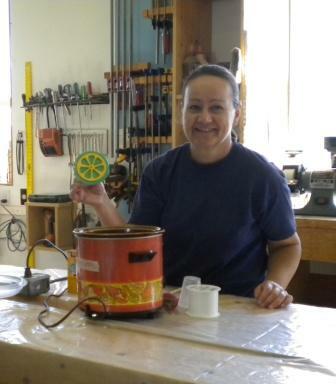 We had Bees wax and paraffin mix in one pot. We had two smaller pots one with hard soy wax and one with soft soy wax. Judy holding a stamp we tried. Soy wax was not to hot for foam stamps. I spent most of the weekend working on fabric I had started many years ago. Back then I only knew of bees wax and paraffin. They are so much trouble to getting the wax out. It left me thinking I would not like to do more batik. The best thing I learned this weekend was more information about soy wax. The soy wax can be washed out with hot soapy water. This is like a miracle to find out about Soy wax. 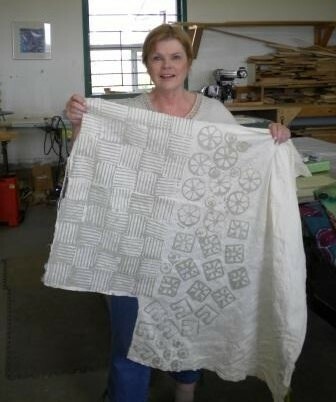 Here is some fabrics I had started a few years back. Still with the wax in it. I am not looking forward to removing the wax. All of this fabric in front of me has Bees or Paraffin wax on it. 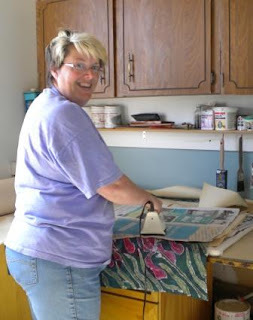 My iris fabric was started years ago and had paraffin used. I am sold on Soy wax. Diane did a wax sampler. She showed us how easy it was to remove the soy wax. We just washed it in hot soapy water. I did three half meters all with hard soy wax on Sunday. I have just washed it and I have all the wax out. I will post photos in a few days. I need to dry and iron it. Dawna with some wax on her silk fabric. 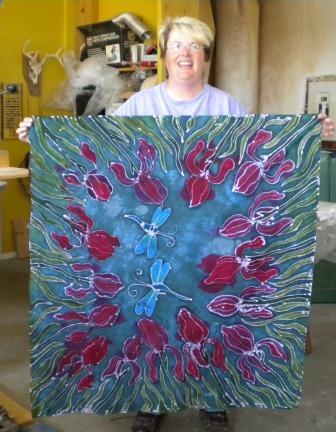 The iris fabric had to get the green leaves and iris part covered with wax and over dyed to get a background colour down. I got all the waxing done Friday. Then I over dyed the dark blue over night. Saturday I washed it, dried and then spent the day removing wax.I still have to get more wax out. There is a wax outline around all the wax parts. I may try boiling. Or I may have to try a solvent to remove the final wax. The fabric is still stiff with wax. I have ironed and ironed and I was not getting it all out that way. Does anyone out there know the answer? let me know. New potato masher for next waxing adventurer. 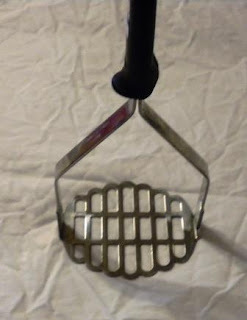 I found the new/old potato masher Monday at the second hand store. I love the shape. I will have to try some fabric with my new stamp and the soy wax. I am really sold on the soy wax. Sorry, Yvonne I did not get a photo of you, next time. Kim was planning to join us but had to work. Keep your eye out for our results. Wish I lived closer. I would LOVE to spend time in your studio. It looks like you had lots of fun creating batiks. I think your Iris is beautiful- You do experiment with so many wonderful techniques _ I can see that you will be making something beautiful with your new fabrics.